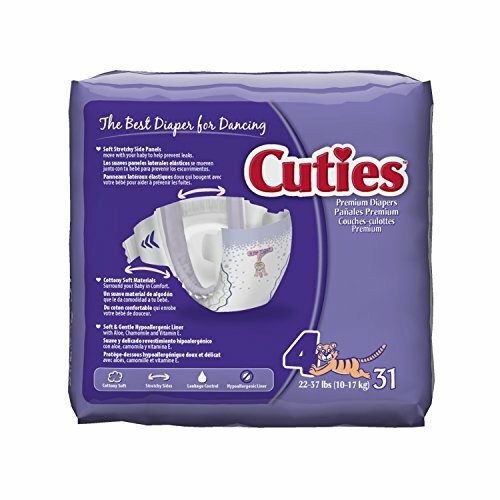 Keep your baby comfortable and dry with Cuties Baby Diapers. A winner of the Parent Tested Parent Approved (PTPA) Seal of Approval, these diapers offer exceptional leakage protection you can trust both day and night. Designed for maximum comfort and mobility for playtime and nap time, this diaper locks in wetness with a flexible ultra-absorbent core. Soft and stretchable waist and side panels move with your baby and help prevent leaks. Adjust the grip tabs for a secure fit. Cottony soft materials surround your baby in comfort. 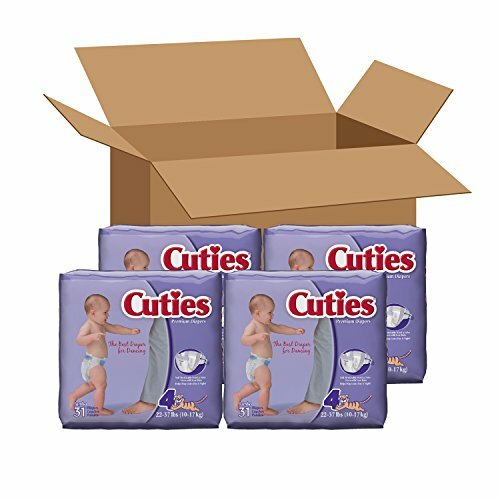 Free of latex, fragrance, dyes, and elemental chlorine, the hypoallergenic inner liner is enhanced with soothing aloe, natural botanicals, and vitamin E. Each box includes four packs of 31 diapers sized for babies weighing 22 to 37 pounds, for a total of 124 diapers. 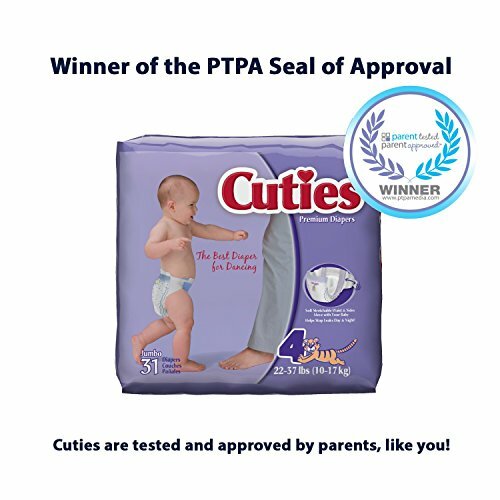 A winner of the Parent Tested Parent Approved (PTPA) Seal of Approval, these diapers offer exceptional leakage protection you can trust both day and night. 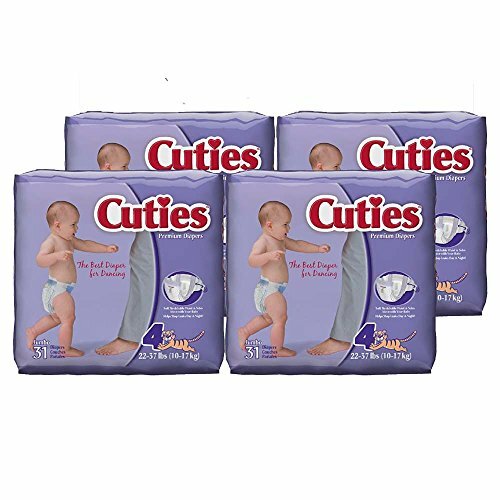 Cuties diapers are 10 times drier and more absorbent than Huggies Snug & Dry; they also lock in more wetness than Huggies Snug & Dry, Pampers Baby Dry, and Luvs. Designed for maximum comfort and mobility for playtime and nap time, this diaper locks in wetness with a flexible ultra-absorbent core. Soft and stretchable waist and side panels move with your baby and help prevent leaks. Adjust the grip tabs for a secure fit. Cottony soft materials surround your baby in comfort. 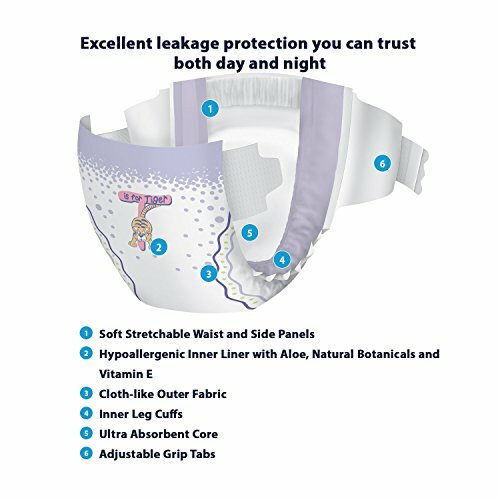 Free of latex, fragrance, dyes, and elemental chlorine, the hypoallergenic inner liner is enhanced with soothing aloe, natural botanicals, and vitamin E. Each box includes four packs of 31 diapers sized for babies weighing 22 to 37 pounds, for a total of 124 diapers. Cuties are manufactured in Pennsylvania and Georgia with attention to quality, safety, sustainability and responsible sourcing practices by First Quality, a family-owned company. First Quality is a leader in developing premium quality products at a great value. In addition to our collection of baby products, we also offer lines of feminine care, adult care, household and bottled water products. If you are not completely satisfied, return the purchased package and unused product for a full refund. Call 1-800-262-0042 for more details. Limit one rebate per household.